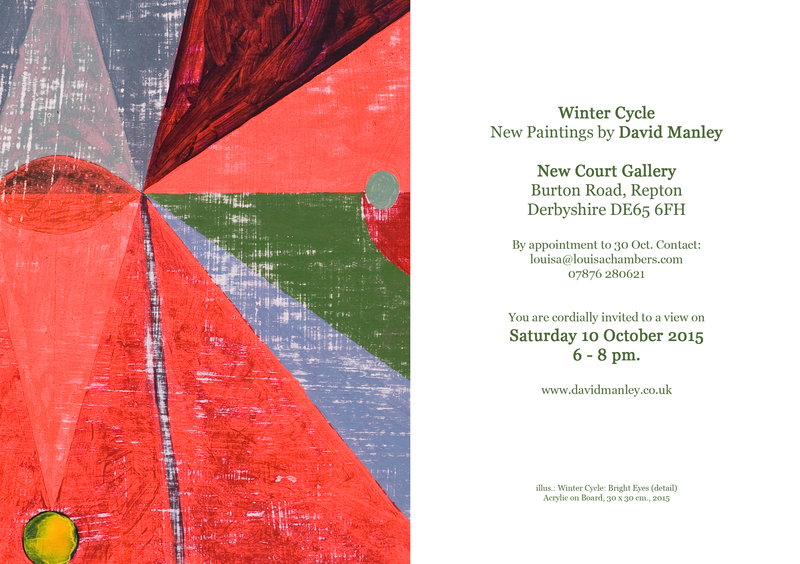 At the New Court Gallery in Repton (incidentally probably the finest space in Derbyshire) the Winter Cycle gets an airing less than nine months after the journey began. All in all I am delighted with the outcome and last evening it opened with a pretty good turnout (especially considering that quite a few of my oldest and dearest friends and family couldn’t make the event) though some others (they know who they are!) had made quite a considerable effort to put in an appearance. I was most pleased. I owe a debt of gratitude to Louisa Chambers (and the rest of the Repton crew) for the opportunity not only to exhibit but to do so in this space and at a location near to both my own home and studio and that of poet Reg Keeling (whose work partially inspired the project). 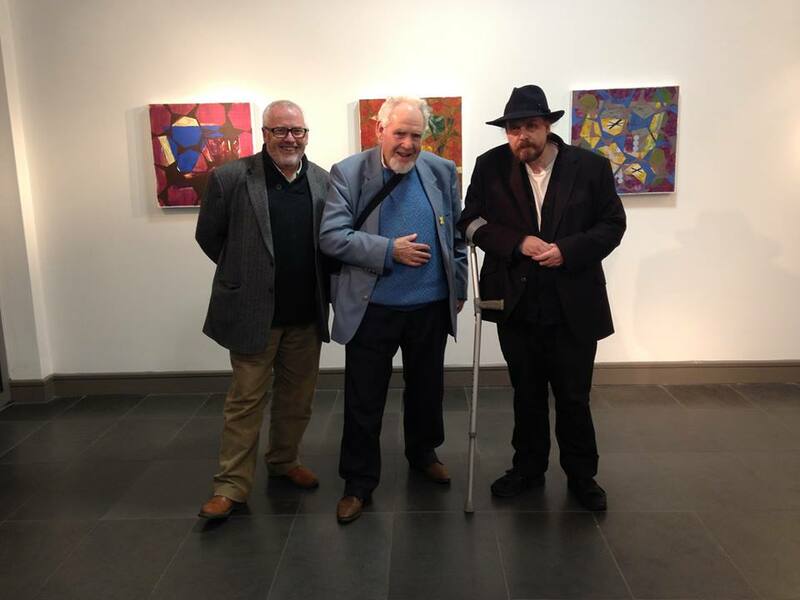 Here’s a cheesy picture of me, Reg and on the right Julian Broadhurst whose recording of Reg’s poems first drew my attention to them. We are standing in front of the three pictures that are dedicated to the two of them and to the Flute Interlude that divides the reading of the poems from the interview between Julian & Reg on his recording. From the top of this blog follow The Winter Suites link to see all the works with the poems. 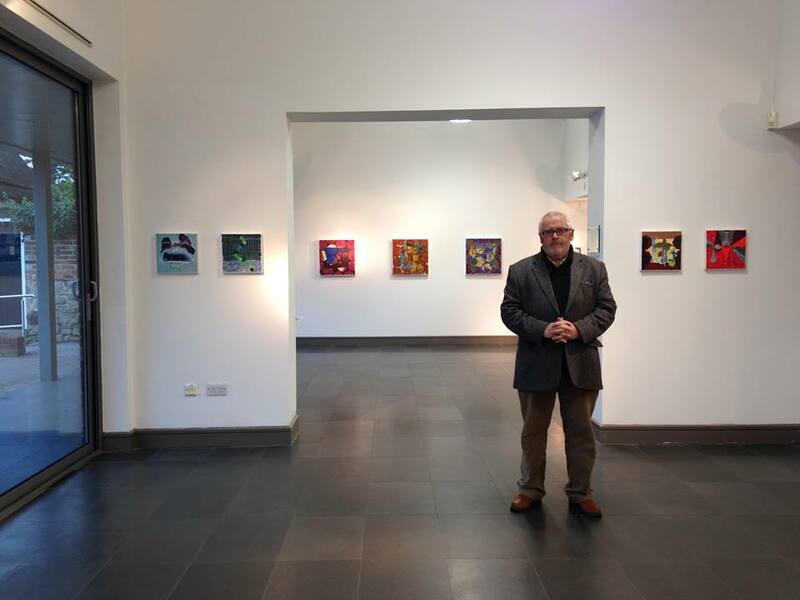 And whilst on the subject of cheesy here’s one of me standing in the space looking pretty pleased with myself…perhaps a little too pleased as there are at least a dozen of the works that – now they are on the walls – I feel need a little (or in one or two cases quite a lot of) revision! But I guess many of us often feel that way. However overall its turned out decently and looks – I hope – pretty solid. I’m just now working on getting the whole sequence of the actual Cycle onto my website with the full text of the accompanying poems. So pretty much sorted and on to my next project – the prep for the trip to Cape Cornwall – courtesy of the Brisons Veor Trust. Its less than two weeks away and I’m really looking forward to it! Technology defeat…best stick to painting? I’ve been trying for over an hour or more to convert the jpg above into a readable but quickly downloadable pdf so I can invite people to the forthcoming exhibition of my Winter Cycle paintings. I’ve just conceded defeat! I like to think I’m outside the ‘silver surfer’/’don’t understand this new fangled stuff’ group of older citizens but it seems no…once I get past the absolute basics of the technology… I’m fairly clueless! However the gist of it all (and given what I’ve just said I imagine that maybe the image above cannot be easily read!) is that the series of 27 small panel paintings that have monopolised much of my painting time in the first half of 2015 will get their first airing from the 10th to the 30th October at the lovely New Court Gallery in Repton, South Derbyshire. 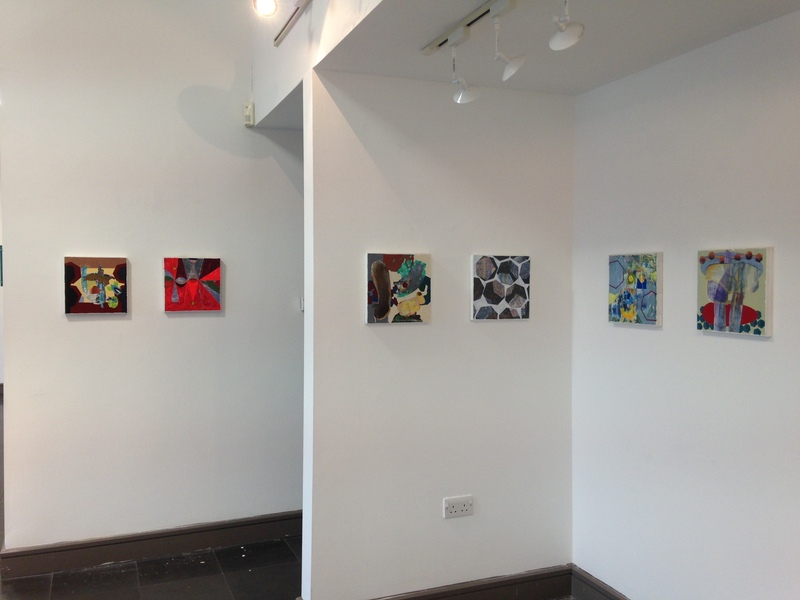 There will be an opening on Saturday 10th October from 6 to 8pm. and it would be lovely to see you there. Alongside the painting cycle we will have a proof copy of a small publication that matches the paintings with the series of 27 poems written by Derby based Reg Keeling – entitled A Winter’s Journey – and that I discovered shortly after setting out on my own journey. I am very grateful for my friend, and fellow painter, Louisa Chambers for facilitating this exhibition and to Julian Broadhurst whose contribution was bringing Reg’s work to my attention. 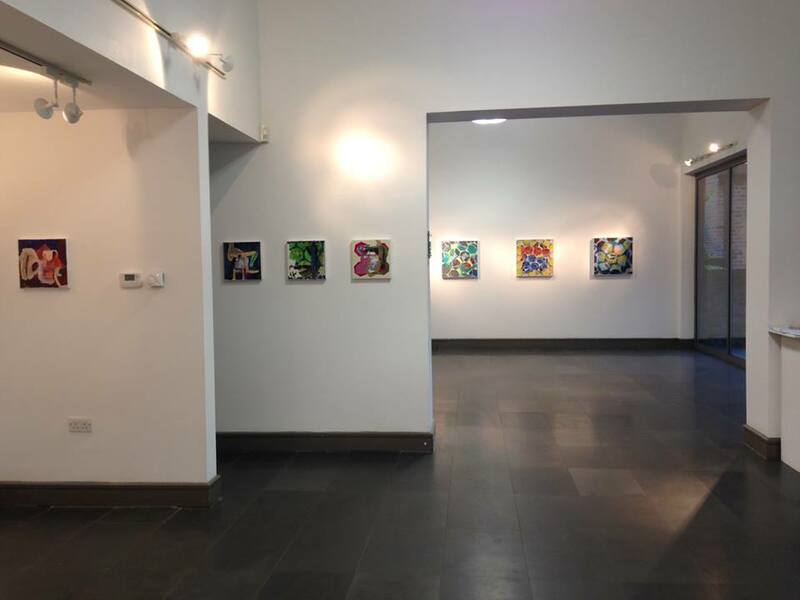 In this exhibition, artist David Manley offers new abstract paintings informed by his reflections on the passing of a season. The Winter Cycle is the result of moving studio from an artists’ complex in an old industrial building shared with 16 others to his home. In the process of shifting his work he rediscovered a set of small panel pictures began and abandoned several years earlier. The move also saw the establishing of a working space facing a large plate glass window into the garden. He fell to thinking about the relative solitude of working from home, often alone for long stretches and the immediate presence of the changing climate. The notion of a group of works loosely based around the seasonal journey from winter to spring occurred with the initial thought of Schubert’s Die Winterreise as a possible connection. However shortly after starting he fortuitously chanced upon Julian Broadhurst’s recording of Derby based Reg Keeling’s reading of his set of poems entitled A Winter’s Journey. The local connection appealed to him and the more he listened he felt (maybe fell) into an empathetic relationship with the text. 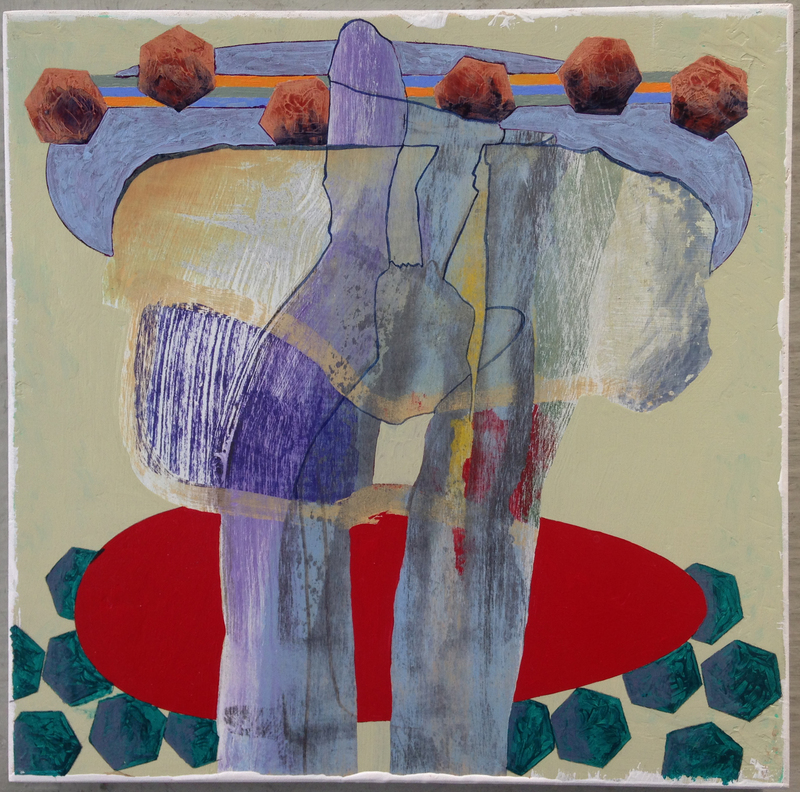 The relationship of the work to the Japanese form Haiku, and to the use of Renku, (linked verse) and Kiru, the ‘cutting’ or juxtaposition of two images or ideas as well as the underlying principles of capturing moments in time and simplicity of language appealed to the painter. As the individual works in his Winter Cycle developed he found himself reflecting on how these ideas might work visually. The Winter Cycle is comprised of 27 small panels each taking a cue (and a title) from a poem in the collection. 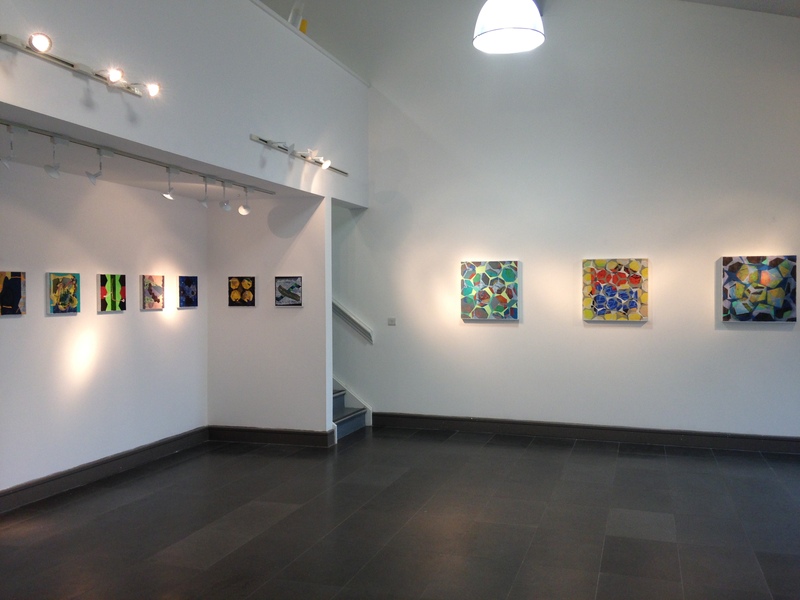 In addition, and in keeping with Julian’s recording (available online), three larger works, two dedicated to Reg & Julian and one entitled Flute Interlude (a portion of a work by Julian that he uses on the recording as a marker between the readings of the poems and the interview between the two of them) make up the project. There are no literal readings between pictures and texts or any explicit connectivity. Both can and do standalone, but there are sympathetic relationships that run between the two and extend outwards to Schubert and many others who have derived meaning from the cycle of seasons and the metaphor of the journey.